Now The Details: Ombudsmen and BP? 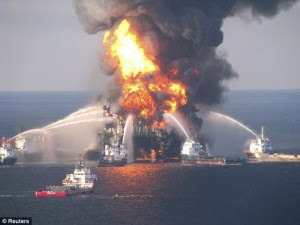 Could an ombudsman have helped BP in handling its disastrous Gulf of Mexico oil spill? Probably not. But an excellent article entitled "In Case of Emergency: What Not To Do" by Peter S. Goodman in today's New York Times Sunday Business section is instructive. Goodman - one of the best business journalists around - writes about crisis management and how public relations stumbles only exacerbated the crises at BP, Toyota and Goldman Sachs. "In times of crisis, communications professional and lawyers often pursue conflicting agendas. Communications strategists are inclined to mollify public anger with expressions of concern, while layers warn that contrition can be construed as admissions of guilt in potentially expensive lawsuits." So it is with media organizations. Those with ombudsmen have found that legal costs actually decline when an ombudsman is there to address public complaints. The Guardian of London noted that within a short period of time after hiring their first readers' editor, the amount of legal work handled by in house solicitors declined by 30% - more than enough savings to pay for the readers' editor and his assistant. A study commissioned by the Iowa Litigation Study Group noted that when a disgruntled reader called the newsroom and spoke with a harried editor, the chances of the reader filing a lawsuit increased. When the reader was directed to an in-house ombudsman, the chances of litigation almost disappeared. Another study has found that when doctors apologize to patients for mistakes, the number of malpractice suits also declines precipitously. Obviously, there is a huge difference between the complaints of shrimp fishermen in Louisiana who have lost their livelihoods due to possible BP collusion in the worst oil spill in US history, and the protests of an aggrieved media consumer who think there is bias afoot. Yet the approaches of large corporations and media organizations are often similar in their approaches to the public: ignore them and they will eventually go away. They may, but the damage to reputations has been done by an instinct to defensiveness. As Goodman writes, "...in the view of many who are paid to extract corporations from terrible situations, Toyoata, BP and Goldman exacerbated their woes by either declining to fess up promptly, casting blame elsewhere or striking adversarial postures with the public, the government and the news media." Too many media organizations act as if they can still ignore public complaints while at the same time, hope to placate them by asking them to interact on their websites. At a time when ombudsmanship continues to grow in academia, government and especially among international media organizations, North American media seem unable to see the value in dealing with their audiences in an non-defensive way. Or at least until they find themselves in the midst of a credibility crisis of BP proportions.